i shot a quick editorial piece for Avenue Edmonton Magazine in early August that was a bit of a challenge. 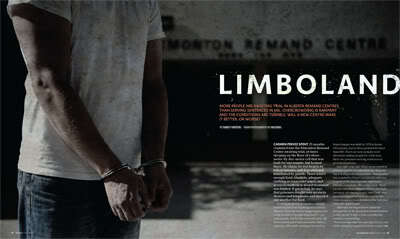 the story was on the Remand Centre in Edmonton, and the idea was to shoot someone in handcuffs outside of the facilities with a gloomy, dark mood. the challenge came when the day of the shoot was plus 30 degrees celsius, and and there was barely a cloud in the sky. there goes my dark gloomy mood. the angle i wanted was right infront of the building so that sign would be in the background (the Remand Centre really just looks like every other office building downtown, so without the sign no one would really recognize it). the other problem i had run into was by 5pm the sun was already westward bound, almost splitting my image in half with a shadow. throw up a flash through with a small softbox for a fill and see what i can create. initially the idea that the art director and i had come upon was to photograph almost the entire building with the model in the foreground. low angle, shooting up. with so much contrast that proved to be difficult. put on a polarizer to see if i could bring back some of the sky, in the end it just killed all the detail in the building. f/16, f/22…. this is where a camera that can sync past 1/250 would have come in very handy. polarizer goes back in the bag. out comes the ND8. i started to shoot some tighter frames, something a bit more artistic, and with a shallower depth of field. ND filters are fantastic!!! there was still the balance of exposing the model and the shadowed building in the background. no huge budgets here to light an entire building. after some post to bring the mood down, i started to think of what else i could do to add some emotion to the image. i don’t play with them a whole lot, but the thought of adding a dirty texture to the image came to mind. and so i did. played with a couple of them and finally decided on a dirty floor that brought an awesome feel to the images. pitch the idea to the art director, she loved it, and that’s that. looks like they took the dirty theme and used it for the entire article design. not too bad…. everything in the end worked out and the image works really well with the layout. next time i’m shooting at night, and bring the army to light up the building.